Hear Ye! Hear Ye! Calling all Tempura Fans! Wheenever I think of tempura, I remember my A-I (aunt) who simply adores this dish. No visit to a Japanese restaurant would be complete without this on the table and she would make sure that every single tempura would be consumed as she hates to see a good piece of deep fried shrimp go to waste. 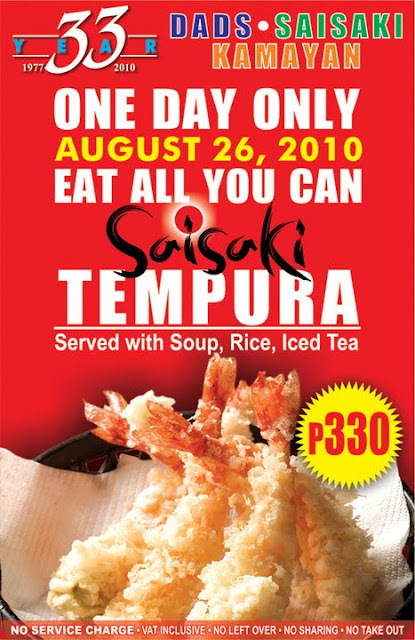 I think she'll be very happy to hear this news... Saisaki will be having a ONE DAY Eat-all-you-can Tempura Buffet for only P330! That's a steal given that you can eat as much tempura as you want plus you get rice, soup and drinks to go with it.